Strongman Robert Oberst, also known as Obie, is a 375-pound force to be reckoned with. In 1 day he eats as much as the average person consumes in 1 week, and trains 4 hours a day. California native Robert Oberst attended high school in Santa Cruz, California where he played football and competed in track and field. He continued playing football at the collegiate level at Western Oregon University, after which he gave the NFL a shot, but did not work out. Robert had begun working as a nightclub bouncer when a co-worker friend and amateur Strongman encouraged Robert to enter the Strongman realm and train with him. Obie said sure, why not, tried the sport and quickly got hooked. Just a quick 4 months of training led to Robert's 2012 debut at the Dallas Europa Amateur Strongman Competition. What an impression he made. First time out, he was awarded his Pro Card. This meant that 2013 would be his first time entering the big leagues. He has been a yearly competitor at the WSMC ever since. Obie's best event is the Max-Log. The competitor has to lift the log off of a built-in stand and raise it over their head as many times as possible within a set time limit. In 2015 at the Arnold Strongman Classic Australia, his 464-pounds lift broke the American record. As he heads up to the 2018 competition, the making of this champion started with a friendly suggestion and led to a World Record. OnFitness: Explain further how you get into Strongman? Robert: Well, I played sports most of my life and dabbled in football. I played at a small college and after that just used by size and became a bouncer at a nightclub. My buddy who worked with me was into the sport and suggested I give it a go. I had nothing to lose at that point, so I started training with him. I've always been an athlete so I wouldn't say I just tried this for fun, but I knew once I decided to attend the 2012 Amateur event, I wanted to be ready. OnFitness: Do you have a coach and/or a training partner? Robert: I'm my own coach, and 2 guys train with me. We spot each other, work in sets, and program-design based on the events. My buddy from the nightclub still trains with me. OnFitness: How do you train before you prepare for competition? Robert: My workouts are all about explosiveness. The events require power. Power means from stop to go, I have to have the burst needed to lift some pretty heavy loads. By now, I know my body and what to do. My workouts are split every day. I start with 1, then about 6 hours later I hit it again. I really only work out hard like that 4 days per week. It's honestly the rest and recovery that are more critical parts. So, what I do is mimic the events when I train. What happens is that an event takes place, then you sit for 6 hours waiting for your turn at the next event, then you sit again. It's downtime straight to explosive time. My 2-a-days are structured to be like competition days. That helps me on the mental part too because it's not easy to get up and go again. My partners and I are good about keeping that accountability, but I know it's really on me. End of the day, it's me and the event, nobody else. I visualize those moments and get myself pumped up to go at it. OnFitness: How do you eat before you prepare for a competition? Robert: I've really learned how important food is with all of this. I've gotten into clean eating this year. There is an obvious difference between taking in pizzas, pasta, and bread to get all that food. I used to be like those other guys and just eat whatever to meet my numbers. But I've got a sponsor making my food now. I'm really thankful for Elite Supplements, based out of New Braunfels, Texas. I'm eating 6 times per day, every 3 hours. I know everybody thinks it's about being big, but I've actually dropped from 440 to 375 from changing my diet. I honestly just feel better, and I know that guys like me have all these health problems and I want to be around for my son. My whole relationship with food has changed. I've got my main meals, breakfast, lunch, and dinner, then I've got my ProMera Whey Pro80 shakes and Alpha Recovery. OnFitness: What foods give you the most power? Robert: I'm eating lean meats, lots of vegetables and then good carbs like rice and sweet potatoes. It's nice because Elite Supplements has it all ready for me. Trust me, I'm still normal and like junk, but now it's like I want to be healthy. I see how it has made me train better and even sleep better. Plus, when I eat stuff like pizza now, it's good going down, but then my body doesn't like it after that. 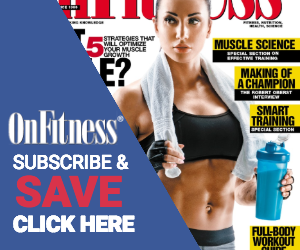 OnFitness: What is the month like leading up to competition? Robert: I'm about to take off to the Philippines, and at this point, I've put all the work in. Like I say, resting and getting off my feet are very important. I have to focus on making it through those long days. Right now, my food consists of more carbohydrates that are meant to re-feed my body. I've learned that good carbs give me energy when eaten the right way and at the right times. My workouts tend to be longer but focus on just a few things instead of trying to get it all in. It's a delicate balance between being ready and feeling ready and then not getting hurt. OnFitness: Do you have a day job, or is this it? Robert: My day job is training. When I decided to do this, it really became a lifestyle. Every day is a day to improve, get stronger, build muscle, and master the technique to win another event. My workouts require stamina, so I have to get off my feet in between, make sure I get my calories in, and then be ready to do this again. The timing of workouts and eating is pretty consuming. After that decision was made back in 2012 when my Pro Card was earned, it had to be all or nothing. Between workouts, eating and recovery, my days are full. I want time for my family too, and I think that is part of my job. OnFitness: What is your proudest moment/any regrets? Robert: I'd say when I was in Australia, in front of the Terminator himself, Arnold Schwarzenegger, breaking the record for Max Log. This is mainly because the former record holder, Mike Jenkins, was someone I greatly admired and respected. Jenkins had passed away, so when they handed me the award, I looked up to the sky in memory of a great competitor. They caught this moment on camera with a picture, and that is my favorite. Now after holding that record for 3 years, I want to keep it for Mike too. Regrets would be just that Deadlift is my weakest event. I just have to keep after it. It's mental for me. OnFitness: Personal life — wife/kids? Robert: I come from a huge family. I'm number 8 of 10 kids. We grew up all over because my dad was in the Navy. Family means a lot to me. I have a 2-year-old son named Atlas and my loving wife. My son is my purpose. I grew up in a big loving family, so I really want to be there and spend as much time as I can with him. Everyone always asks me about the pink Chuck Taylors. Like I say, I'm a family guy; I wear these for my mom who is a breast cancer survivor. The pink stands out, and I want to bring awareness to this cause. At 1 point I did have a T-shirt campaign where the proceeds went to breast cancer research too. OnFitness: What does the future hold for you? Robert: Right now, it's about my trip next week. Just being a dad too. I want to do well in the Philippines, so I'm not really looking past that. OnFitness: What is your relationship with ProMera? Robert: ProMera Sports is what fuels my workouts. ProMera Whey Pro80 is my protein shake of choice. This supplement is super clean, tastes good, and doesn't interfere with all the other meals I have to get in the day. You have to consider that I drink 3 to 4 shakes per day. Being full of liquid would leave little room for all my actual meals. The shakes help me get the protein requirements in. I really think that we all should be taking creatine because it has so many benefits. My other favorite ProMera product is called Alpha Recovery. It's my superfood. It seriously has dramatically improved my performance. In between my 2 explosive workouts, about 4 months ago I tried the Alpha to recover and repair the damage and to build up for the next session. It's got the electrolytes, branch-chained amino acids and glutamine I'm looking for. Every workout, I'm hitting it hard and breaking down my body to build it back up. I was just at the L.A. Fitness Expo sharing my story and success using the products, especially Alpha. I'm actually super-grateful for finding it because I know my performance has improved. OnFitness: Anything else you would like your audience/followers to know about you? Robert: I'm a huge supporter of our armed forces. My father is a Navy veteran, and my brother is in the Army. I like visiting different bases and hanging out with service members as much as I can. I pretty much just work out with the guys and sometimes give a speech or 2. I want to give back somehow, so it's nice just to give them an outlet and something to do when they're away from their families and serving our country. OnFitness Magazine wishes Robert the best of luck this year. He took the time out of his busy training schedule just before leaving for the Philippines to share his Strongman fitness journey with us. Robert Oberst is strong both physically and mentally, and a great family man. May he have continued success and lift that log like it's nobody's business. From nightclub bouncer to world record breaker in pink Chucks, today Robert is a standup competitor and incredible athlete. The World's Strongest Man Competition began in 1977, with the first event ever being held in Universal Studios, California. The history of athletes, titles won and records beaten has an impressive list of legends. The year 2008 marked the establishment of the Hall of Fame. The Competition consists of 16 different events that test the human body's capability to produce force and power. This physical challenge requires incredible stamina, intense training, and precise strategy to push one's self and the object to the very limit. This year, April 28th through May 6th, the World's Strongest Man Competition will be held in Manila, Philippines. The first 4 days are the qualifiers for events including the Load and Carry, Circle of Strength, Squat Lift, Deadlift, Kettlebell Toss, Bus Pull, Arm Over Arm, Overhead Log, Dumbbell Medley, and Atlas Stones. May 5 and 6 consist of the finals and include events in the Frame Carry, Loading Race, Vehicle Pull, Vehicle Deadlift, Max Overhead and Atlas Stones. The Load and Carry involves 5 objects weighing between 100 and 164 kg that have to be loaded onto a platform over the distance of about 50 feet. Circle of Strength also called Conan's Wheel, involves lifting a long bar that is on a wheel where the athletes use all their force to pivot this barbaric weight. The Squat Lift is being able to get the required range of motion for the squat with heavy weight on the back. The Deadlift is performing this movement pattern with correct technique and as much weight as possible, now lifting from the ground up. For the Kettlebell Toss, the athletes have 60 seconds to toss the weights over the designated height of the bar on a platform. The Bus Pull is the impressive drag of a bus 100 feet. The Arm Over Arm is done in a seated position with the athlete using a rope to pull the object down a course as fast as possible. Overhead Log has the athlete lift the log over their head as many times as possible in a race against the clock. The Dumbbell Medley is a test of strength who can lift the heaviest dumbbell. Atlas Stones has the athletes lift the extremely heavy spherical stones onto a platform. The Frame Carry is lifting the frame off the ground and carrying this a designated distance. The Loading Race is lifting barrels out of a lagoon and bringing them back to dry land. The Vehicle Pull is now an even greater challenge than the Bus Pulls. These events have been termed differently over the years and have evolved to test the athletes' mental and physical abilities. Obie has stayed among the top 10 in all of these events since he started.